I was lucky enough to travel a lot with my previous job as a product design engineer. We used to go to exhibitions, conferences, trainings, visiting suppliers, manufacturers and partners. Or just to work from another location, since it was a big company and had different branches in different cities and countries. Once we went for market research in various sports shops around Liverpool , which was in our doorstep. That was a great time, because that’s what a designer has to do. Go out, do research, see how products work in real life by their users. Not just stay in an office behind a computer screen. 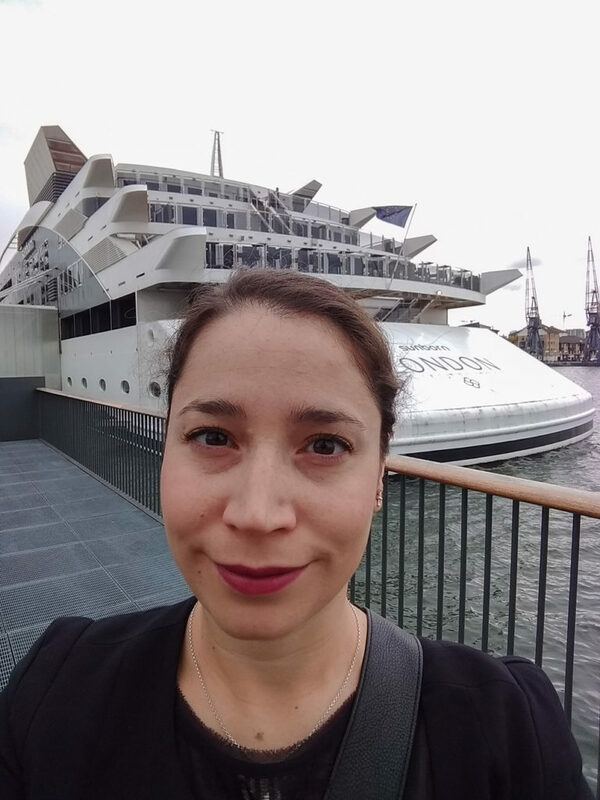 This is just me blabbing and changing the subject… But this post is about the time I stayed at a yacht hotel! So, this time we had been in an expo in London, which was taking place in the ExCel convention centre. This is located in the Docklands area in the banks of river Thames, on the east of Canary Wharf, which is where the big banks are located. It’s some of the big skyscrapers you can see in pictures of London skyline. 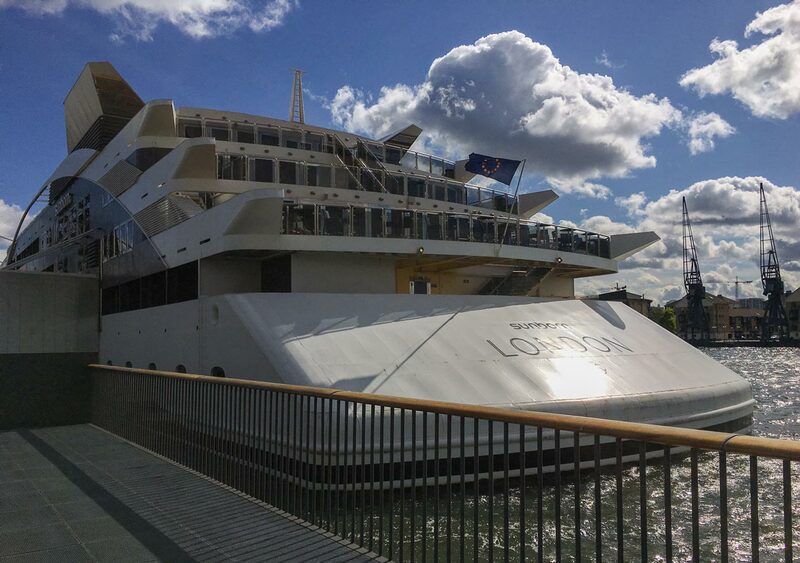 The hotel I stayed in was the Sunborn London, a 4 star luxury hotel on a yacht moored at the Royal Victoria Dock right next to the ExCel centre. 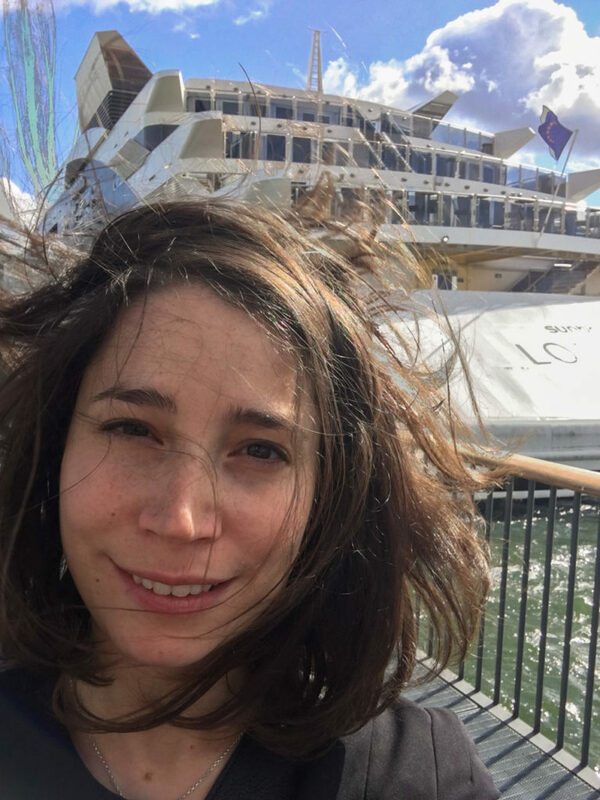 So I was very excited that I got to stay in this luxury yacht, which is quite expensive and I wouldn’t stay there on my own dime. But everything was paid by my company, so I got to stay there for free. Yay! 🙂 It was because we didn’t book our accommodation until the last moment, so every other hotel in the area was fully booked. This is usually the case when there is a big expo there. The lobby was pretty luxurious with impressive double staircases that reminded me a bit of the Titanic. Golden details, chandeliers, comfy sofas and shiny marble floor complete the lavish picture. Apart from the stairs, they also have lifts to take you to the rooms and outside. The cool thing was that my room had a little balcony, but unfortunately, it was on the side of the docks, rather than the riverside. I had booked the Executive Dockview King Room, because it had the same price as the Classic Dockview King Room at the time. The room inside was pretty big and comfy, but I was not impressed by it. Although it had nice wooden furniture, they did seem quite dated. The big mirror, the desk and the couch were a nice touch. It even had a good coffee machine with espresso capsules. The toilet was an actual boat toilet; you know, with a small step before you get in and the door that locks with a boat lock. If you ever stayed in a ship cabin, then you know what I mean. 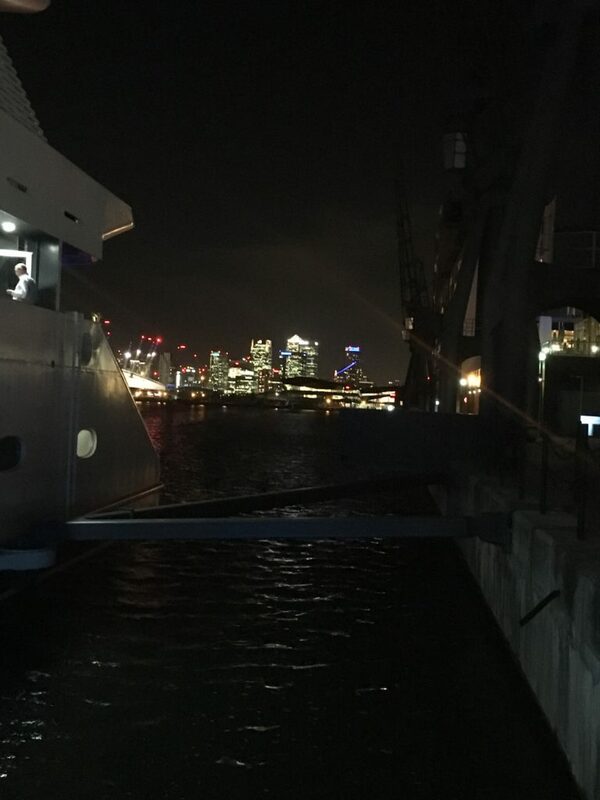 From the restaurant, you can go out to the balcony and have a great view of river Thames and the Canary Wharf, experiencing London from a different point of view. The good thing is that you can visit the bar and restaurant and enjoy the river views, even if you don’t stay at the yacht hotel. They offer afternoon tea for £30 per person, which would make a nice treat for a special occasion and you don’t have to break the bank. 😉 You can see better pictures of the hotel and the views on their website. Here is a picture of the afternoon tea with a view from Sunborn London’s Instagram page. 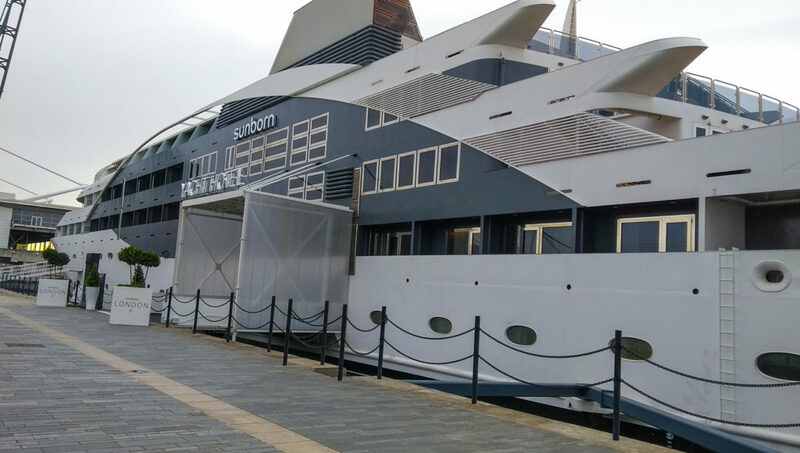 My stay at the Sunborn yacht hotel was not the first time I stayed on a floating hotel. A few years ago, I had spent a week on a river boat in the Netherlands, travelling from Amsterdam to different cities while visiting companies and having lectures on the way. It was an amazing experience I had during my master studies, that I will talk about another time. 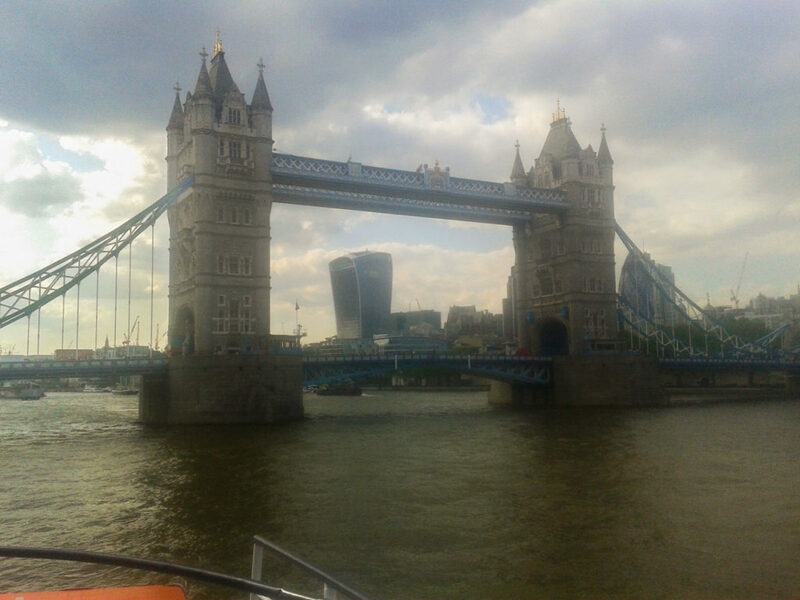 And then, there is the time I worked on a party boat for an evening in London and had the greatest view of the Tower Bridge from right underneath. I’m sorry for the terrible picture, it was taken with my old phone in 2016. >> Did you enjoy this article? Share it on social media so more people can discover it!